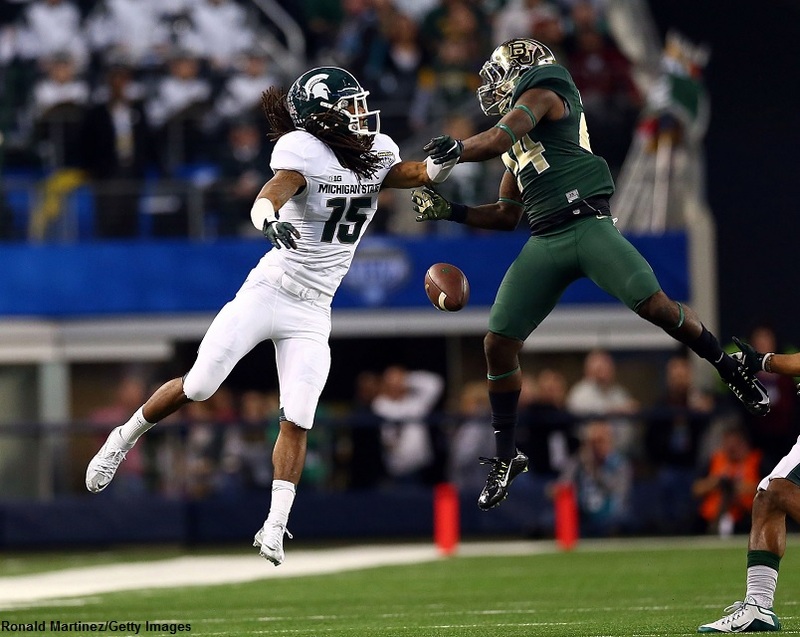 With the 2015 NFL Draft fast approaching, teams that are weak in the secondary are sizing up the draft’s cornerbacks. Who will be the future stars, and who will be the busts? Dave Archibald ranks his top 12 cornerback prospects. Pros: Good size and outstanding speed. Capable in both press-man coverage and in zone. Experienced and solid. Cons: Grabs too often in man coverage. Can be beaten with lateral quickness. Struggled at times with pick routes. Bad hands. Fit: Outside corner in any system. Bottom line: Won’t put up gaudy interception totals but will be a good starter for a long time. Pros: The best off-man coverage skills in the class. Mirroring skills are excellent. Good awareness in zone and explosive when driving downhill. Decent height and excellent athleticism. Contributes on special teams. Cons: Very light at 175 pounds. Struggles to get off blocks. Needs work in press coverage, especially with his jam. Fit: A scheme that runs a lot of zone or off-man; will take more time to contribute in press or in the slot. Bottom line: Mirroring abilities and zone skills make him a rare commodity. Pros: Terrific ball skills, opportunistic. Good size. Capable in a variety of coverages. Very competitive. Strong press abilities. Cons: Clashed with coaching staff, drew suspensions and was kicked off team. Competitiveness gets the better of him at times: commits dumb penalties or becomes visibly frustrated. Occasional lapses; beaten surprisingly often given his talent. Fit: Scheme-diverse, but needs the right coaching to fit his personality. Bottom line: Do you feel lucky? Could be the best corner in the class or lack of discipline could keep him from reaching his full potential. Pros: Historic performance in Combine drills combined with ideal cornerback frame. Showed improvement year-by-year on the field. Experience at safety. Cons: Missed much of his final year with shoulder injury. Film earlier in his career was uneven. Struggles to get off blocks. If beaten by receiver’s initial move, can panic and commit penalties rather than trust his athleticism to get him back in the play. Fit: Has the tools to fit anywhere but between injury and lack of polish, might not be ready week one. Bottom line: A bit of a risk but has the athletic gifts to make teams willing to gamble. Pros: Great build and very athletic for his size. Tenacious in coverage on long-developing plays. Physical in press coverage and in run support. Cons: Just 10 career starts. Poor footwork, especially in his backpedal. Limited recognition of route concepts in zone coverage. Too aggressive going for the ball, which can result in big plays. Reportedly failed multiple drug tests at LSU. Recent foot surgery. Fit: Press-man scheme where he doesn’t need to start right away. Bottom line: Could ultimately be the best corner in this class but needs some development time. Pros: Big frame (6’1”, 205 pounds), ideal for press coverage. Experienced in zone and man concepts. Versatile. Former safety and tackles like it (see below). Plays special teams. Cons: Doesn’t play to timed speed (4.45 40) and has trouble recovering when beaten deep. Inexperienced at corner and savvy WRs will prey on him with double-moves and stutter-steps. Fit: Versatile, potentially fitting outside, in the slot, or at safety in a variety of schemes. Bottom line: High floor given his ability to shift to safety and contribute on special teams; ceiling will be determined by his ability to refine his coverage and press skills. Pros: Physical, aggressive, and competitive. Strong tackler. Experience inside and outside, at safety and in linebacker-type roles. Playmaker (see clip). Contributes on special teams. Just 21 years old. Cons: At just 5’9”, his size will limit him in some matchups. Aggression hurt him at times as he bit on double moves or took poor angles. Coming off an ACL tear in December. Fit: Slot corner on a team that doesn’t need him to start right away. Can also play safety. Bottom line: If he were three inches taller and healthy, he would have been in contention for the best corner in the draft. Pros: Highly competitive. Perhaps the best run defender in the class. Experienced in press coverage. Has played some in the slot. Only 21 years old. Cons: Average speed and agility. Struggled against top receivers. Short arms hurt his ability to jam against some receivers. Maturity questions because of auto incidents. Fit: Number two corner in a press-man scheme. Bottom line: Lacks the tools to defend top receivers but his toughness and experience will help him contribute. Pros: Ran a 4.38 40. Looks to help and make plays on the ball from zone or off-the-ball coverage. Willing and aggressive tackler. Experienced and comfortable in press coverage (see clip). Plays special teams. Enters at age 21. Cons: Smaller than ideal. Struggles to get off blocks in the run game. Bad hands (just two career interceptions). Inexperienced in the slot, which may be his best NFL fit. Tangentially involved in off-field issues with teammates Williams and Jameis Winston. Fit: Number two corner in a press-man scheme. Possible conversion project to the slot. Bottom line: A fine athlete and experienced, but size and hands limit his ceiling. Pros: Has a remarkable feel for when to look back and play the ball, and when to play the receiver’s hands. Converted WR with excellent ball skills (see clip). Opportunistic in zone coverage. Decent press skills, especially defending fly patterns. Able to recover when beaten off the snap. Can return kicks. Cons: Too handsy at times. Slow to flip his hips and respond to cuts from bail position. Not a strong tackler; plays small. Unrefined footwork hurts him against quicker receivers. Nursing a hamstring injury which prevented him from working out at the Combine. Fit: Scheme-diverse skillset, but needs more development before he can start. Bottom line: Impressive college highlight reel, but may take some time to adjust to the NFL. Pros: Adequate size. Explosive driving downhill in zone coverage. Some ball-hawking ability. Tenacious in staying with receivers on scramble plays. Surprising physical toughness (see clip). Cons: Inexperienced at cornerback (played basketball prior to this season) which shows in his press technique. Lacks long speed and can be beaten deep. Poor Combine showing. Fit: Cover 2 corner or conversion to safety, to play up his zone skills and toughness and cover up his deficiencies. Bottom line: Backstory makes him an interesting prospect, but man coverage limitations will likely push him to safety. Pros: Excellent open-field tackler. Works to get off blocks and help in the running game. Patient mirror in off coverage. Good ball skills and strong hands to knock balls away from receivers (see clip). Drives downhill from zone to dislodge balls and make tackles. Cons: Lacks the frame to play press in the NFL. Heavily penalized. Peeks into the backfield too early at times and can get burned. Poor Combine showing. Fit: The slot, or outside in a system that plays a lot of zone. Bottom line: A physical player with some intriguing strengths who will need to find the right fit in the NFL. Footage courtesy of DraftBreakdown.com. Raw video cut by Adrian Ahufinger (@ahufinger7), JMPasq (@jmpasq). Give them a follow on Twitter.